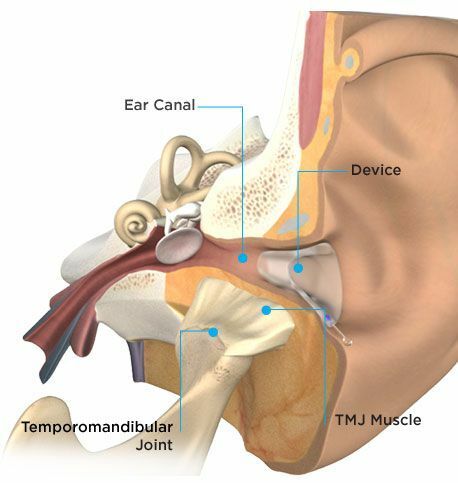 Living with temporomandibular joint (TMJ) disorder is uncomfortable and sometimes even quite painful. Until recently, treatment has largely consisted of avoiding hard foods, using anti-inflammatory pain medications, and wearing a mouthguard. 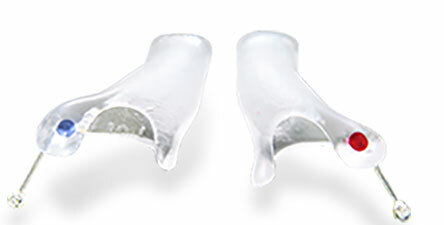 A new solution for TMJ disorder is now available – Cerezen™ Ear Canal Inserts. This is an almost-invisible FDA-cleared treatment for TMJ pain that does not affect your eating, bite, or speech. Temporomandibular joint disorder is a group of disorders that affect the temporomandibular joint (the jaw). Arthritis, trauma, teeth grinding, and jaw clenching are all associated with TMJ disorder, but the root cause isn’t fully understood. If you have TMJ disorder, you may experience clicking or grating when you move your jaw, particularly when chewing. You may feel your jaw locking up when you try to open or close it. Finally, you may have pain in your jaw that spreads into your ear, face, or neck. This pain can range from mild to severe. What are Cerezen™ Ear Canal Inserts? Cerezen™ Ear Canal Inserts for TMJ disorder pain are a pair of little devices that you insert into each ear canal. They look like earplugs, but they are hollow, so you hear normally with them on. They have little posts attached to help you remove them easily. Once they’re in your ear canals, they are almost invisible. If you are a good candidate for Cerezen™ Ear Canal Inserts, our audiologists will make a mold of your ear canal while your jaw is slightly open. Your ear canal collapses by about 20 percent when you close your jaw. The custom-fitted Cerezen™ ear canal inserts prevent your ear canal from collapsing and hence provides support to the surrounding tissue, including the TMJ. We believe it is this support that provides relief from the pain of TMJ disorder. Another factor at work may be the change in nerve signals sent to your brain while wearing the device, which makes you aware, both consciously and subconsciously, of when you clench your jaw or grind your teeth. In a clinical study of this device, 100% of the patients reported good or excellent satisfaction with Cerezen™ Ear Canal Inserts. It is not visible, and it doesn’t affect eating or speaking or change your bite. After 3 months, it was tolerated on average over 20 hours per day, versus 8 hours for dental appliances. There were no serious side effects related to using the device during the study. What are the Benefits of Using Cerezen™ Ear Canal Inserts? It is hollow and does not disrupt hearing. It is nearly invisible from the outside. It does not disrupt eating or talking. It is easy to insert and remove. It is custom-fit to your ear canal for optimal performance. Are There Any Side Effects or Limitations of Using Cerezen™ Ear Canal Inserts? Cerezen™ Ear Canal Inserts are safe and is made from the same materials that have been used in hearing aids for decades. It is recommended that the device not be used in the shower, while swimming, or in a moist environment like a sauna. The device should be removed before playing contact sports. Cerezen™ Ear Canal Inserts are an exciting new development in the treatment of TMJ disorder, which affects millions of people. With its ease of use, this device is an ideal option for many people suffering from jaw pain and discomfort. Please call for an appointment with Dr. Ganc to determine if Cerezen™ Ear Canal Inserts are right for you.